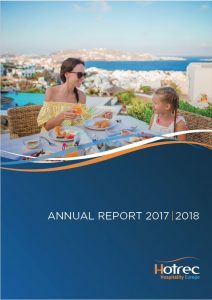 HOTREC is pleased to present to you its 2017/ 2018 Annual Report covering the association’s activities from April 2017 to April 2018. And a message from Ms. Susanne Kraus-Winkler, HOTREC President, and Mr.Christian de Barrin, HOTREC CEO, who look back on HOTREC’s activities and achievements developed by the HOTREC Team together with HOTREC Members. Check our digital version of the Annual Report !